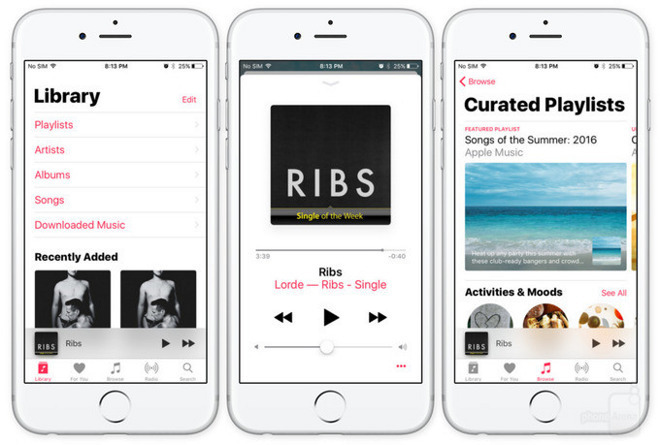 Less than 18 months after its debut in 2015, Apple's fledgling music streaming service Apple Music recently surpassed 20 million subscribers, a milestone that took rival Spotify some seven years to reach. The achievement, which comes only three months after Apple Music hit 17 million subscribers, was confirmed to Music Business Worldwide on Tuesday. For Apple, the 20 million subscriber mark punctuates a year and a half of sizable gains. Starting with a strong initial install base of iOS and Mac device owners in June 2015, the number of paying Apple Music subscribers reached 6.5 million in just four months. By February, Apple's streaming music service topped 11 million and was attracting about one million new users per month. Apple Music subscriber figures hit 13 million in April, 15 million in June and 17 million as of the company's last official update in September. In a statement to Billboard, Apple SVP of Internet Software and Services Eddy Cue took the opportunity to tout Apple Music's impact on the wider music industry. "It's been quite a year," Cue said. "We were thrilled to see that we could take [artists'] passions and drive them all the way to No. 1. Chance the Rapper, who we put on Apple Music exclusively, hit the top 10 on the Billboard charts [based on streams alone], and I can't recall that being done before." Apple Music's biggest rival, Spotify, announced a paying subscriber base of 40 million users as of September, a number set to grow beyond 50 million users early next year. Products like Apple Music, Spotify and Pandora are leading the charge as consumers increasingly pivot away from physical media and, more recently, digital downloads in favor of all-you-can-eat streaming services. In 2016 alone, Spotify added some 12 million paying subscribers, while Apple Music attracted 10 million users. Those numbers are in addition to free services like Pandora, YouTube, Beats 1 Radio and Spotify's own free-to-stream tier. Of note, Cue said some 60 percent of Apple Music subscribers have not made a purchase from the iTunes Music Store in the last 12 months. Further, more than half of all subscribers live outside of the U.S.
With substantially similar content libraries, and the seeming demise of streaming exclusives, companies are turning to pricing promotions and rate cuts to bolster customer growth. Apple Music, for example, expanded its half-price student membership option in November to cover a total of 30 regions worldwide, and is said to be mulling a 20 percent price drop to better compete with rivals like Amazon's Music Unlimited. Despite a minor falling out with Universal Music Group, Cue said exclusives will continue in the near term and is expectedly upbeat on the future of Apple Music. "We can't forget that, as an industry, we still have very few music subscribers. There are billions of people listening to music and we haven't even hit 100 million subscribers," Cue said. "There's a lot of growth opportunity." Editor's note: This article has been updated to include a statement from Apple SVP Eddy Cue.